In Hillsborough County there’s a service called the Sunshine Line that helps people get where they need to be if they don’t have a car. 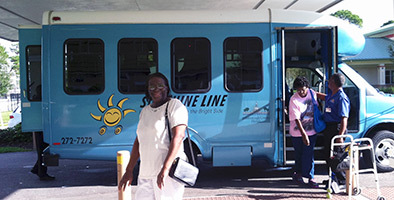 The Sunshine Line, funded by the Hillsborough County Commission, provides door-to-door transportation and bus passes for elderly, low-income, and disabled people who do not have or cannot afford their own transportation. Ola Mae Smith in Tampa depends on the service. Sunshine Line takes people mostly to medical appointments and aging services day care and nutrition sites. Vehicles used for door-to-door service are wheelchair accessible. The service ranges from free to $5 per trip. Reservations can be made a week in advance, and must be made no less than two days in advance. Bus passes must be requested at least five days in advance to allow time for the pass to be mailed. There are 60 Sunshine line vans on the road, making upwards of a 180,000 trips per year. For more information on the Sunshine Line, call 813.272.7272.